Here are seven excellent reasons to leave the house, in the form of eateries that serve dishes that are tasty as well as healthful and even challenge the term “healthy eating” as we know it. And also transcend the usual organic, vegetarian or calorie-counters' offerings we conjure up. Fresh from the garden: One great example of a healthy dish that really warms you up and comforts you on a cold winter day is stuffed vegetables. What is special about Makom Balev, other than its location and design, is the fact that the staff carefully pick the herbs, vegetables and greens from the restaurant’s own organic garden. They make their stuffed delicacies from a variety of vegetables, filled with whole-grain rice, chopped mushrooms, tofu and organic spices in tomato sauce. Thus, ultimately, in addition to every sinfully rich dish on the menu – like gnocchi with cream or hamburgers – you’ll find offers that are made from all organic vegetables picked only hours before, whether it’s garden eggplant or lettuce. And when it’s so simple and delicious, you have to wonder: Why aren’t there more restaurants with their own gardens? Low sodium and original: Meshek Barzilay (Barzilay Farm) is a fairly long-standing institution, which moved last year to Tel Aviv's Neveh Tzedek after 10 years on Moshav Yarkona. To talk about health without mentioning this lovely vegetarian-organic haven, which specializes in healthful cuisine and has recently gone a step further and ventured into raw and natural foods, is a sin against the genre. Meshek Barzilay's kitchen is based on organic fruit and vegetables, with the accent on freshness and tasty combinations. The menu changes with the seasons, with every dish showing two main emphases: tastiness and maximum nutritional value. And although the kitchen is mostly vegan with some vegetarian, it is outstanding in its variety and originality, thanks to the fine use it puts to grains and legumes. For example, you’ll find a vegan Vietnamese roll, made of rice paper filled with avocado and algae in ginger sauce, garlic and soy sauce. You’ll be happy to know that almost all the dishes on the menu are low-sodium because they use celery salt, herb salt and salicornia. And if you’re ready for a sweet chocolate dessert that’s healthy too, they’ve got it, in the form of one that's made of cocoa chips with cashew butter and dates in strawberry sauce. To wash it all down, there's a dazzling array of shakes and juices, to which you can add alcohol for a (fairly) healthy and (very) tasty beverage. 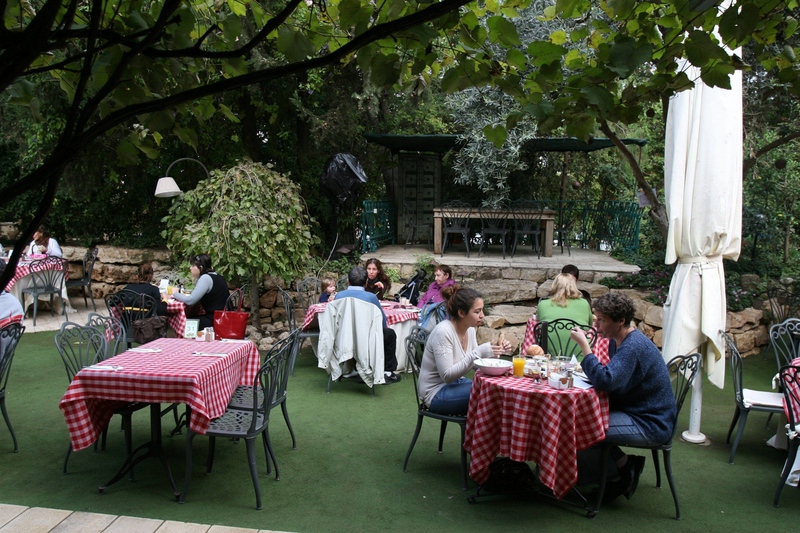 Ever-changing menu: Shorashim is one of the best-kept secrets of the Haifa suburb of Tirat Hacarmel, and it’s time to make its acquaintance. It’s the healthy answer to what used to be referred to as “workers’ restaurants.” In fact, Shorashim was first of its kind vegetarian-and-vegan dining hall for workers at a famous sandal factory; four years ago it morphed into a small restaurant that is open to the public and offers an environmentally friendly menu, particularly for vegetarians and vegans, although there’s fish and sometimes chicken, too. The daily menu varies and the day we were there we happened on some delicious salads, one with beets and cranberries, and another with roasted squash and amazing, refreshing spices. We also tasted a surprising millet quiche, a fine moussaka with red lentils (so we didn’t miss the meat), whole-grain rice soup just right for an after-storm day, and excellent rice fritters with silan and lemon sauce. The price was right, too (39 shekels, or about $10, for a vegan lunch, for example) and the service was friendly. Edible and ecological: Everything began at BarBaSaba in an abandoned yard, whose restoration demanded much work. There are chairs and tables collected from the trash, and water from the air conditioners that is channeled to irrigate the restaurant garden. They also clean the place with eco-friendly products. And the items on the menu respect the environment – including dishes made of organic raw materials combined with special homemade sauces and cocktails and pickles that are also organic. All this is served at a bar with a ficus tree growing in the middle, under the open sky. Among the healthy meals you’ll find at the bar: cholent made of tofu and hummus "pastrami," sautéed with roasted onions and vegetables (peppers, pickles and tomatoes) and served with raw bread, no yeast and no oil. Another dish is a kind of original, sandwich-y take on an Israeli dish that’s almost a cliché – thick slices of roasted eggplant in olive oil (the only oil they use here), all served in a sandwich with basil pesto. 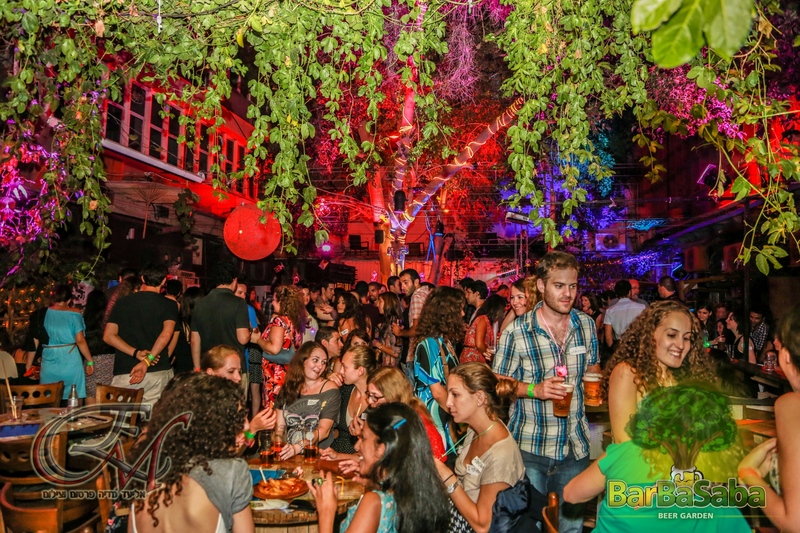 BarBaSaba, which shares its kitchen with the adjacent Saba Gepetto, offers more than 40 beers on tap, some organic and non-pasteurized, including Rothschild Beer, from a small brewery in Ashdod. Out of the cave: When talking healthy, we can’t ignore the latest culinary fad – Paleo, which champions ancient, Paleolithic-style nutrition, and holds that eating meat is natural and healthy. And not only is meat good, so is fat. And cholesterol problems? A myth. So if you’re wild about meat, blood and bone marrow, this is the place. At Chop Chop they’ll offer you many cuts, low in fat or dripping with it – turkey breast in date honey, garlic, sweet paprika and coriander seeds, and goose breast in honey and garlic, sweet paprika, thyme and black pepper. 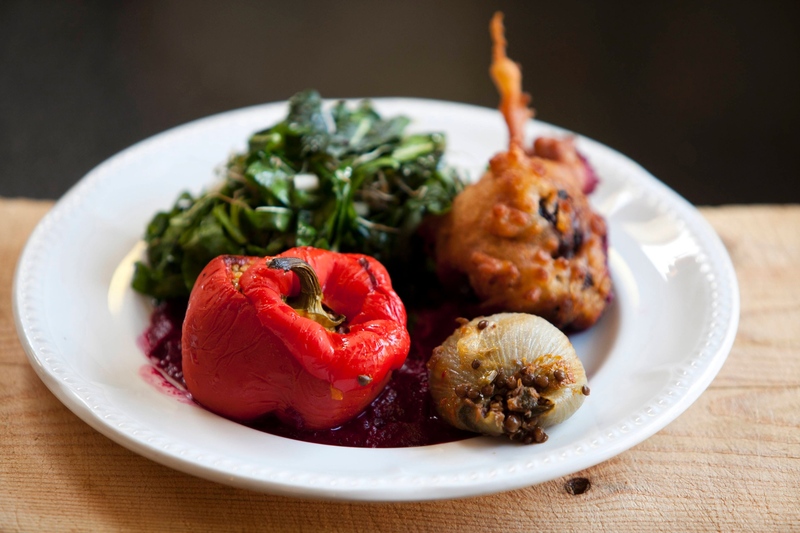 Red wine is used in the sauces to intensify the flavors; these range from balsamic to biting chimichurri, served with baked potato in sea salt, salads and Romanian-style pickles. Time to get out of the cave! Curing your ills: A healthy mind in a healthy body is to be strived for, they say. So at Tevalu, besides the menu, with only the highest quality ingredients, there’s the atmosphere, which seems to have been designed to cure you of whatever ails you, including the maladies of dealing with a daily routine, air conditioning and urban crowding. And because people say breakfast is the most important meal of the day, we chose to spoil ourselves here with a healthy, tasty one. The dish, boker ija, for example, consists of vegetable pancakes, a hard-boiled egg, slices of eggplant and tahini (it's so great to start the morning with it!). It comes with vegetable salad and your choice of bread – whole rye, black ciabatta, light sourdough bread or focaccia. We decided to forgo the last option (just this once) because this time we were already starting the morning off healthy and happy (i.e., vegetable patties, tahini and whole grains). If you come after breakfast (served until 12:30), another healthy option is vegan hamburger. Not necessarily only because it’s vegan and wonderful, made of mushrooms and black beans, but mainly because it’s served in a roll with tahini, lettuce, tomato slices, onion and pickle, together with rice or a potato. Bowlful of salad-y joy: When talking about healthful cuisine, it’s sometimes better to leave the stage with the most obvious, premier dish: salad. Because no matter how you cut it, salad is almost a synonym for this kind of food. Indeed, while not all salad constitutes a healthy meal, there’s no heathy meal without salad. Or at least, without vegetables. But why settle for less when you can have more? And precisely for that reason we’ve chosen to close our list with Anastasia, a coffee shop that’s also vegan, ecological and healthy. And, almost impossibly, its offerings are also delicious and amazingly rich. And there’s more. Goji berries, acai powder, maca root, spirulina, nettle, wheatgrass, turmeric, cocoa, and chia seeds. There’s not enough space to talk about the value of each of these, but here are a few of the excellent salads you’ll find on the menu: kohlrabi-Wakame salad, made of kohlrabi sticks, algae and wakame with scallion rings, pumpkin seeds and toasted sesame in miso and sesame oil; tropical cucumber salad, with iziki algae, barley-grass powder, scallions, cranberries, pineapple slices and toasted pistachios; and another (and interesting) one, with bulgur wheat and nettle, served with chopped Brazil nuts, goji berries and blueberries. 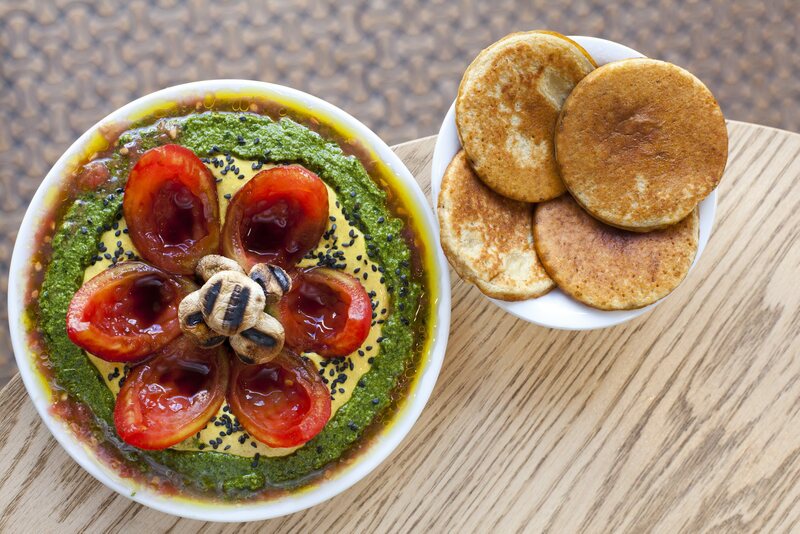 And last but not least, a good many of the dishes at Anastasia combine our beloved tahini with exciting other ingredients that will surprise even the most ardent aficionados. There’s tahini with miso, turmeric tahini, and tahini with gomasio (sesame salt). Besides that there are refreshing fruit and vegie shakes, date coffee and almond milk. And even a few mischievous cocktails.